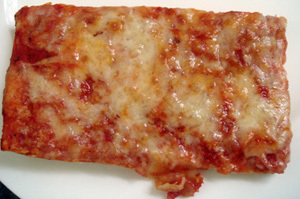 Old school cafeteria-style pan pizza, mmmm, nothing like it. I haven’t had this in many years, probably since middle school but maybe high school. My sister and I loved the commercial with the kid having his big brother prepare the pizza for him and having the cheese go “blub blub blub”. I never heard of Betzio’s before but saw it at the market and felt it was perfect for a comparison. Um…where to start? This is not the pizza I remembered when I was a kid, and it’s definitely not the pizza shown on the box. First, the perferations on the dough do not let the pizza break off to make a neat rectangle. This shape pictured above is what Ethan got after trying to snap off the perferations. Second, the cheese – where is it? The pizza is sparingly sprinkled with minimal cheese revealing a somewhat “zesty” sauce but it’s really like ketchup with too much herb. Ethan said it wasn’t oregano though because he likes oregano, so I don’t know what it was. The dough is bland and tasteless and so chewy that I just scraped off the cheese and sauce because I couldn’t deal with it. Betzio’s had much better everything. The cheese tasted better and there was more of it. The sauce was milder but the dough was much more pleasant, light, soft (but not mushy) and crisp on the bottom. Ethan said it really reminded him of pizza he got at school growing up and it was good in a comforting way. Definitely Betzio’s. I just can’t believe how dissapointing Ellio’s was. Did I like it before because I was kid or has it gone way downhill in the past 25 years? It’s almost shameful to pass this off as pizza. Anyway, at least we’ll always have the commercial. Blub blub blub. When it comes to store brought pizza, I love Red Barron pizza. I never heard of Ellio or Betzio pizza. I used to have a weird obsession with cafeteria “pizza flips”. I’d love to find something similar in Wisconsin. Does anyone know where to buy some? The herb taste was probably fennel, it makes its way into a lot of “Italian” food. I think most companies go overboard on it. whats Ellios are crispy at the bottom u had to cooked it wrong? I only eat New York pizza from the streets of Brooklyn! It appears Betzio’s was founded by the same man who started Ellio’s. I love Betzio’s Frozen Pizza, but can’t find it anywhere. I live in Northeast Phildelphia. Please tell me what supermarket sells it so I can get it as soon as possible. Please help I can’t stand Ellio’s and thats all they seem to sell. I love betzios. Apparently the betzios recipe was the original recipe of ellios! But then ellios was sold off to new owners who promptly changed the recipe. 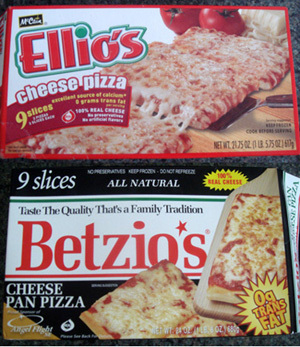 So the old owners of ellios began in 1993 producing betzios pizza using the original ellios recipe. Unfortunately i too cant find betzios in the supermarkets anymore. Nor can i find any website for the product. Betzios once had a website but that is long gone. I’m guessing they discontinued making betzios. In 1963, Ellio’s Pizza was founded by Elias Betzios and George Liolis. About 1993 he began Betzios Pizza . 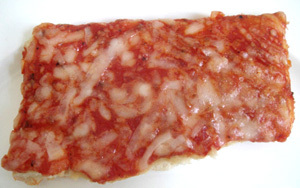 This is sometimes referred to as a breadtangle of pizza.